Brumfield, A., Chaudhary, N. and McGraw, T. E. (2017). Secretion of Adipsin as an Assay to Measure Flux from the Endoplasmic Reticulum (ER). Bio-protocol 7(7): e2204. DOI: 10.21769/BioProtoc.2204. Bruno, J., Brumfield, A., Chaudhary, N., Iaea, D. and McGraw T. E. (2016). SEC16A is a RAB10 effector required for insulin-stimulated GLUT4 trafficking in adipocytes. 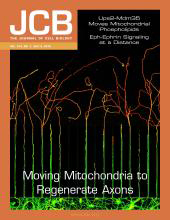 J Cell Biol 214: 61-76. In this protocol we describe a quantitative biochemical assay to assess the efficiency of endoplasmic reticulum (ER) to Golgi protein transport in adipocytes (Bruno et al., 2016). The assay takes advantage of the fact that adipocytes secrete various bioactive proteins, known as adipokines. As a measure of ER to Golgi flux we determine the rate of bulk secretion of the adipokine adipsin post washout of Brefeldin A (BFA) treatment using immunoblotting. Because BFA treatment results in an accumulation of adipsin in the ER, the exit of adipsin from the ER upon BFA washout is synchronized across cells and experimental conditions. Thus, using this simple assay one can robustly determine if perturbations, such as knocking down a protein, have an effect on ER to Golgi protein transport. Newly synthesized proteins destined to be secreted from the cell traffic through the secretory pathway to the plasma membrane (PM). The secretory route includes transport from the ER to the Golgi, across the Golgi stacks, and movement from the trans Golgi network (TGN) to the PM. Each of these transport steps provides nodes for regulation of secretion. While most cells are capable of secreting proteins, certain specialized cell types are professional secreters of specific proteins. Adipocytes, for example, secrete hormones, called adipokines that affect the energy metabolism of various organs. To better understand the molecular underpinnings of adipokine secretion, we have developed an assay to study the transport of adipsin, an adipokine, from the ER to the Golgi of cultured adipocytes. A traditional and commonly used method of studying ER to Golgi transport is to monitor the exit of the temperature sensitive vesicular stomatitis virus G protein ts045 fused to GFP (VSVG-GFP) from the ER (Presley et al., 1997). An advantage of using the adipsin secretion assay to study ER to Golgi transport in adipocytes is that the flux of an endogenous protein from the ER is monitored rather than an ectopically-expressed reporter protein. For each experimental condition, plate 3T3-L1 adipocytes in 6 wells of a 24-well plate (~½ million cells/well) in DMEM/10% FBS. Note: 3T3-L1 fibroblast cells are differentiated in a 10 cm dish (~1 x 107 cells/dish) according to the protocol by Subtil et al. (2000). ~3.3 million cells are used per condition, day 5 or 6 post differentiation in DMEM/10% FBS (one 10 cm dish is sufficient for three conditions). After plating in a 24-well plate, allow cells to recover overnight in a 37 °C/5% CO2 incubator before proceeding to Procedure B. Note: A work flow diagram of the ER secretion assay is shown in Figure 1. Figure 1. Work flow diagram for ER secretion in adipocytes. A. Adipocytes are plated in 6 wells of a 24 well plate. B. 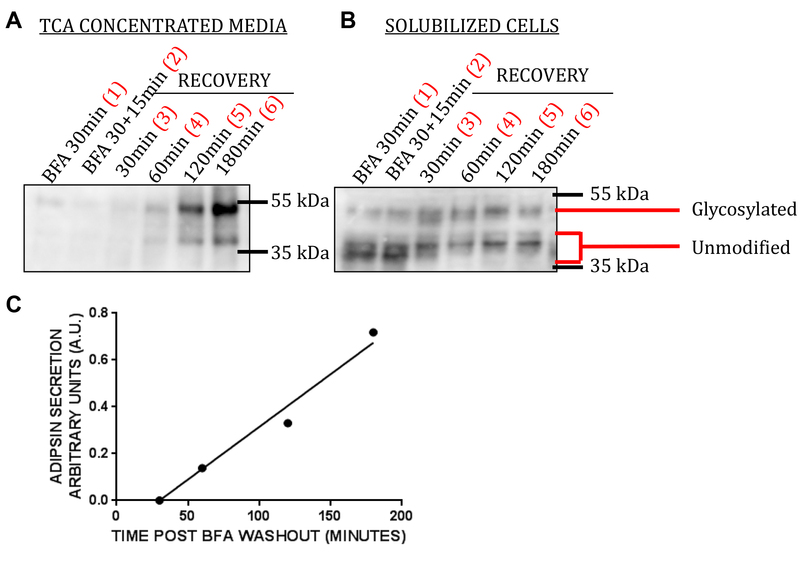 Cells are treated with BFA for 45 min, BFA is washed out, and allowed to recover for various amounts of time in BFA-free media. Red numbers indicate points of media collection and cell solubilization from a well of the plate. Prepare 5 μg/ml Brefeldin A (BFA) in M-199 protein-free media warmed to 37 °C. Wash all cells three times with M-199 media. Following aspiration of the last wash, add 150 μl of 5 μg/ml BFA (in M-199 protein-free media) to each well. Incubate cells for 30 min at 37 °C/5% CO2. Upon BFA treatment the Golgi rapidly collapses and Golgi proteins undergo retrograde trafficking to the ER. Furthermore, BFA treatment inhibits anterograde trafficking from the ER to the Golgi, and consequently Golgi proteins accumulate in the ER (Fujiwara et al., 1988; Lippincott-Schwartz et al., 1989 and 1990). Thus, the majority of post-ER adipsin is redistributed back to the ER and the bulk of intracellular adipsin accumulates in the ER. BFA treatment serves as a way to synchronize cells to allow for accurate comparison of adipsin secretion across conditions. Collect media from well #1 in a 1.5 ml Eppendorf tube. Wash cells in well #1 one time with 1x PBS and add 100 μl of 1x LSB. Scrape cells and collect solubilized cells in a 1.5 ml Eppendorf tube. Set the media and solubilized cells aside on ice. Remove the media from wells #2-6 and add 150 μl of pre-warmed 5 μg/ml BFA (in M-199 protein-free media) for 15 min at 37 °C/5% CO2. This additional BFA treatment ensures that all post-ER adipsin has been cleared. Collect media and solubilize cells from well #2 as described in step B3. Wash wells #3-6 three times with M-199 media to washout the BFA. Add 150 μl of M-199 media (without BFA) to each well to allow for recovery. 30 min post recovery, collect media and solubilize cells from well #3. 60 min post recovery, collect media and solubilize cells from well #4. 120 min post recovery, collect media and solubilize cells from well #5. 180 min post recovery, collect media and solubilize cells from well #6. Boil solubilized cells collected from wells #1-6 at 95 °C for 5 min and store at -20 °C. Note: Samples can be set aside on ice until all samples have been collected, and boiled together once collection is complete. Add a 1:10 dilution of ice cold TCA to media collected from wells #1-6 (i.e., add 15 μl of TCA to 150 μl of media) and incubate on ice for 30 min. Spin samples in a microcentrifuge at 16,000 x g, 4 °C for 5 min. Discard the supernatant using a pipette tip. Note: The pellet will appear as a thin, clear smear on the side of the Eppendorf tube and can be difficult to observe. When discarding the supernatant, one should avoid touching the pipette tip against the side of the tube containing the pellet as to not disturb the pellet. Add 200 μl of cold acetone (cool at -20 °C beforehand) to the pellet and vortex. Spin samples in a microcentrifuge at 16,000 x g, 4 °C for 5 min to recollect the pellet. Wash samples once more with cold acetone (repeat steps C3-C5). Remove supernatant from the second acetone wash and air dry pellet at room temperature for two minutes, followed by placing samples in a 95 °C heat block for two minutes to ensure the acetone is fully evaporated. If residual acetone remains, samples can be left for additional time at 95 °C. Add 30 μl of 2x Laemmli sample buffer to each pellet and boil samples at 95 °C for 10 min. Store samples at -20 °C. Run samples of TCA concentrated media and solubilized cells on a home-made 10% polyacrylamide gel (see Figures 2A and 2B). Note: If the cell lysates are viscous, samples can be passed through a 26 G ½ needle multiple times until less viscous. Transfer proteins to a nitrocellulose membrane, and block the blot in 5% milk/0.1% Tween-20/PBS for 1 h at room temperature. Probe blots for adipsin using an goat anti-adipsin antibody diluted 1:500 in 5% milk/0.1% Tween-20/PBS overnight at 4 °C. Wash blots 3 x 5 min with PBS/0.1% Tween-20 at room temperature. Incubate blots with HRP conjugated Donkey anti-Goat secondary antibody diluted 1:5,000 in 1% milk/0.1% Tween-20/PBS for 1 h at room temperature. Wash blots 3 x 5 min with PBS/0.1% Tween-20 at room temperature. Develop blots using chemiluminescence detection system. To measure the rate of adipsin secretion, quantify the amount of adipsin secreted at each time point post BFA washout for each condition by densitometry analysis of the Western blots (i.e., Figure 2A, lanes 3-6). To correct for variations in total cell number in the different conditions, calculate that amount of cell associated adipsin following 30 min BFA treatment and following the additional 15 min treatment (i.e., Figure 2B, lanes 1 and 2) and take the average of the two measurements. The amount of cell associated adipsin before BFA washout is used as a measure of cell number because before washout the amount of secreted adipsin is negligible and nearly all of the adipsin is cell associated. Divide the amount of adipsin secreted at each time point post BFA washout (Figure 2A, lanes 3-6) by the total cell associated adipsin (Figure 2B, average of lanes 1 and 2). We use ImageJ software for densitometry analysis. We observe two bands when we probe for adipsin. The bottom band is the unmodified form and the top band is the glycosylated form of adipsin. Under BFA treatment, the majority of adipsin in WT cells is cell associated and unmodified because adipsin is redistributed to and trapped in the ER (Figure 2B, lanes 1 and 2). Following BFA washout, the amount of cell associated adipsin decreases (Figure 2B, lanes 3-6) and the amount of secreted adipsin increases linearly with time (Figure 2A, lanes 3-6). As expected, the majority of secreted adipsin is glycosylated. When quantifying the amount of secreted or cell associated adipsin at a particular point in the assay, the intensities of the two bands should be summed. Generate a plot of the amount of adipsin secreted (corrected for total cell associated adipsin) vs. time post BFA washout, and fit the values with a linear curve fit (Figure 2C). The rate of adipsin secretion post BFA washout is the slope of the linear curve fit. Figure 2. Representative data. A. TCA concentrated media; B. Solubilized cells collected from wells of the plate at various points in the assay (see Figure 1) are run on a polyacrylamide gel and probed for adipsin. C. Plot of amount of adipsin secreted as a function of time post BFA washout; fit with a linear curve fit. For 1 L of 1x running buffer dilute 1:10 with H2O, add 10 ml of 10% SDS. For 1 L of 1x transfer buffer dilute 1:10 with H2O, add 100 ml of EtOH. This work was supported by the National Institute of Diabetes and Digestive and Kidney Diseases (grant RO1 DK52852 to T.E.M.). A. Brumfield is supported by National Institutes of Health training grant 2T32GM008539-21. This protocol has been adapted from Bruno et al., 2016. Fujiwara, T., Oda, K., Yokota, S., Takatsuki, A. and Ikehara, Y. (1988). Brefeldin A causes disassembly of the Golgi complex and accumulation of secretory proteins in the endoplasmic reticulum. J Biol Chem 263(34): 18545-18552. Lippincott-Schwartz, J., Donaldson, J. G., Schweizer, A., Berger, E. G., Hauri, H. P., Yuan, L. C. and Klausner, R. D. (1990). Microtubuledependent retrograde transport of proteins into the ER in the presence of brefeldin A suggests an ER recycling pathway. Cell 60: 821–836. Lippincott-Schwartz, J., Yuan, L. C., Bonifacino, J. S. and Klausner, R. D. (1989). Rapid redistribution of Golgi proteins into the ER in cells treated with brefeldin A: evidence for membrane cycling from Golgi to ER. Cell 56(5): 801-813. Presley, J. F., Cole, N.B., Schroer, T.A., Hirschberg, K., Zaal, K.J., Lippincott-Schwartz, J. (1997). ER-to-Golgi transport visualized in living cells. Nature 389(6646): 81-5. Subtil, A., Lampson, M. A., Keller, S. R. and McGraw, T. E. (2000). Characterization of the insulin-regulated endocytic recycling mechanism in 3T3-L1 adipocytes using a novel reporter molecule. J Biol Chem 275(7): 4787-4795.